So…I’m going to the Cubs Game on Monday, September 19th so I do NOT want to get up Tuesday morning to teach class! Yep, I’m being a stinker and lazy….I get to do that once in a while! I will send out a text to remind you Sunday night! Don’t forget to weigh-in on Fridays if you want, not mandatory, but helpful to keep you track and focused! We had a KILLER workout this morning and we will do it (not the same one of course…it as in a KILLER workout) again tomorrow…..and Friday! 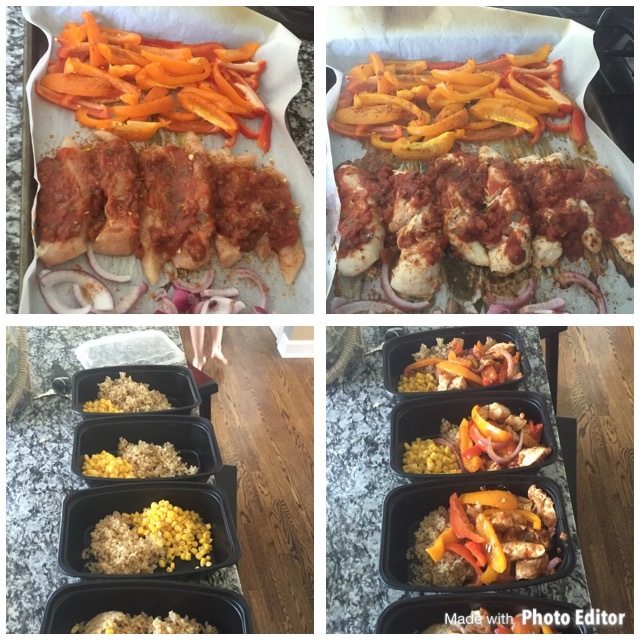 SO….I made this meal for my lunches for the week and it was awesome and super easy! You need 2 peppers (any color), 1 onion, and chicken breasts or chicken tenderloins. Picture 1- Place all items on parchment paper covered cookies sheet. Peppers on one side, chicken in the middle, and onion on the other side. Drizzle or spray olive oil on veggies. Sprinkle taco seasoning on top of chicken. Bake at 400 degrees for 20 minutes. Picture 2- Looks Awesome just like that! Now cut/shred chicken. Picture 3-Place small amount of quinoa or rice (I use the qunioa from costco and divided it into 1/4 cup serving size) and add corn if you would like. Picture 4- Mix chicken, peppers, and onions on cookie sheet and divide into four containers! Enjoy!